Discussion in 'iPhone and iPad Games' started by serenefox, Sep 20, 2016. Our team of artists will bring you more content throughout the year. Happy Exploring! This app may not run properly on the iPhone 4s or earlier. Hidden away deep in a jungle forest lies a mysterious dungeon. Discovered long ago then forgotten, only to be discovered again by the planets new inhabitants. As they explore different areas of the old world. Curiosity gets the best of everyone sooner or later. 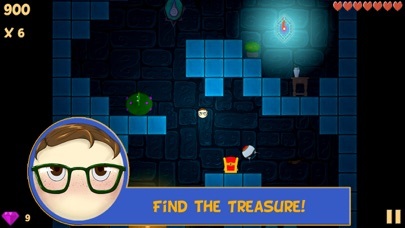 Soon it becomes a challenge to see who can go the farthest down and grab all the treasure they can possibly find. Dangers around every corner. Join our heroes to become the dungeon's next master. Enter into the dark abyss in Don't Pop! Dungeon's endless dungeon explorer! Enjoy multiple hours of entertainment! Play up to as many as 25 plus unique characters, each with their own styles and personalities. 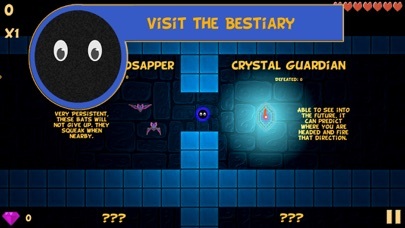 This is no ordinary dungeon crawler, it is a dungeon flyer! Never go through the same dungeon layout twice as every level will always be different. Come out on top by picking up 3 different types of power ups. One gives you a shield to deflect most incoming projectiles. Another gives you a magical touch that doubles the gems you pickup. Finally the gem magnet pulls in all gems dropped by navigating the dungeons. You can also receive power ups by spending tokens in between rounds in the power up shop. Along with the power ups, you can also play Mini Games to earn pockets full of gems. Spend your hard earned gems in the main menu on new character possibilities. 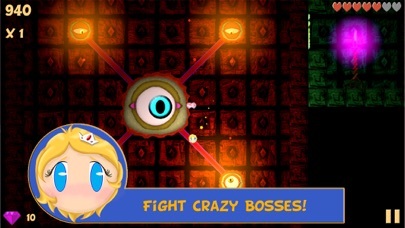 Engage in combat with multiple enemies, with crazy and challenging bosses in different dungeon difficulties. 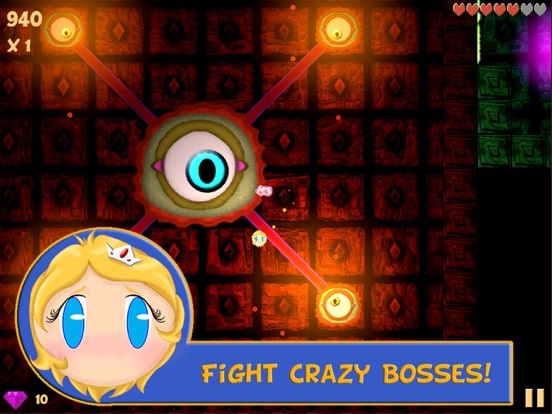 Each boss has its own personality and set of skills that will make each encounter one to remember! 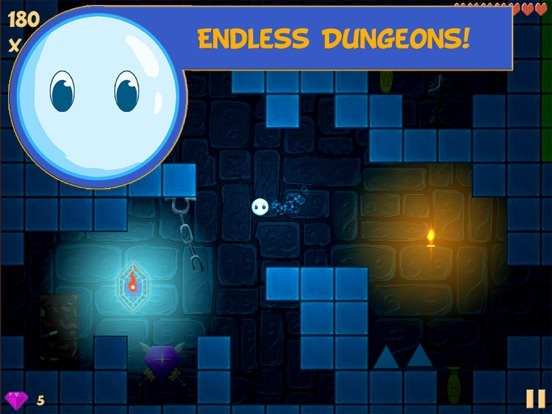 Be prepared to face them with power ups and quick reflexes to further dive deeper into the mysterious dungeon upon their defeat. Choose between six different original soundtracks to explore with unlimited dungeon possibilities. 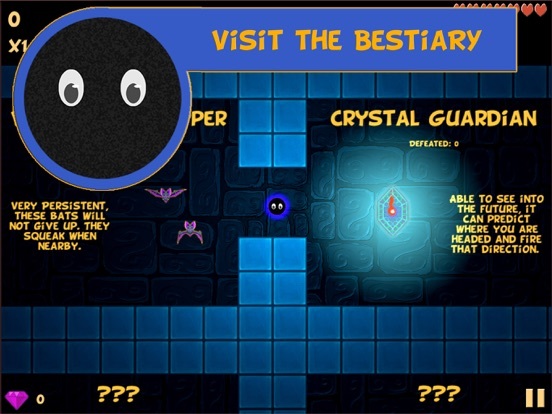 Visit the bestiary to see everything you have come across, defeated, and destroyed. Learn close to 50 enemies and their stories as to why they are dwelling deep down in the mysterious dungeon. 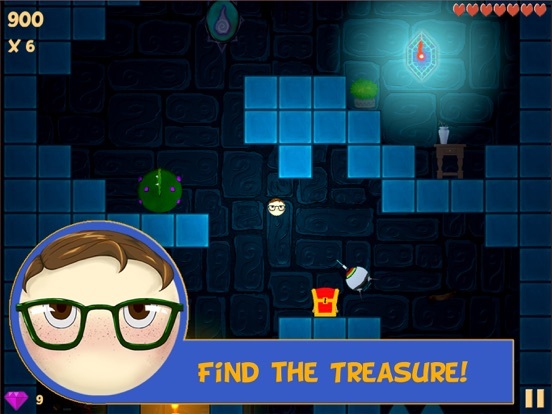 Accept the challenge, discover treasure and download today! Our team of artists will bring you more content throughout the year. Happy Exploring! This app may not run properly on the iPhone 4s or earlier. Looks great what are the IAP ? There is only one in app purchase and it is to purchase 10 tokens which allows you to play mini-games and get power ups in the shop in between rounds. However, it isn't the only way to get tokens, you can also watch an advertisement or just get them from playing. Watching advertisements and the IAP are both completely optional. We wanted the game to be fun for everyone so if you like the game and want to basically unlock cool characters a bit faster or support us you can either watch ads or make an in app purchase or both. Or if you don't want to spend anything or even watch ads you don't have to. It's a game, it suppose to be fun! Yeah I figured most people wouldn't mind, I myself one of them as well. Also the game has been recently updated to fix two separate things. I also wanted to thank the touch arcade community. According to analytics, the game is getting hundreds of downloads. A lot of downloads are coming from this site as well. We are now running a contest here for Don't Pop! Dungeon. Enter for your chance to win. For residents in the United States only. Just updated the game for a higher chance of more enemies spawning in the first dungeon sets. Also fixed some small issues and tweaked some values that players have been asking for. Huge Update For "Don't Pop! 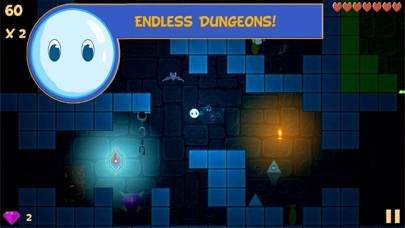 Dungeon"
The game runs even smoother than before. Planning on adding a story mode to the game in the near future. New Update 1.1.4 posted for Don't Pop! Dungeon. +Added more instructions to the "Touch" Tutorial. +Removed the ability to drag the character around using the touch control scheme as that is not the intended way to control a character when using the "Touch Controls", where as swiping is. +Slightly reduced the game's file size. +Removed Daily Reward to allow smoother start up. +Various Fixes and Performance Improvements. Get it, and Play it now! Is this endless or procedurely generated? Currently it is only endless but there are plans for a story mode in the near future. As for the procedural generation part, yes it is. Updated the Game to Version 1.1.8. New health and lives system. Increased the amount of tokens gained by watching an ad. Increase the amount of tokens gained from purchasing them. Fixed a bug causing the leaderboards and achievements to inaccessible. Added a new enemy and more spawns through the dungeons.